In our meeting with Sen. Schiavoni, a group of 10 companies with representatives from Apex Clean Energy, First Solar, Schneider Electric, Tradewind Energy, and Open Road Renewables among them, discussed the job creation potential associated with advanced energy. Participants represented a wide range of advanced energy businesses from across the state including solar, wind, electric vehicles, grid software, combined heat and power, energy storage and energy efficiency. Sen. Schiavoni asked many questions about the types of good paying advanced energy jobs in Ohio. 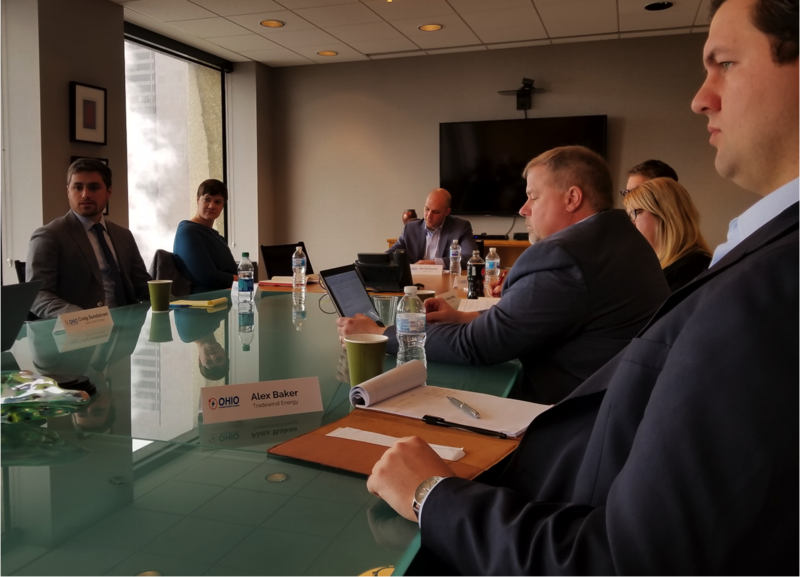 The more Sen. Schiavoni heard from the business voices in the room, the more eager he was to meet with the Ohioans that make up the advanced energy sector. This, he said, would provide him with a better understanding of the wide array of people that make up the advanced energy sector. As participants discussed policy uncertainty and barriers to investment in Ohio, Sen. Schiavoni, noting the rapid growth in advanced energy jobs, asked how much greater those numbers would be had the state not stymied renewable energy and energy efficiency in 2014, resulting in a two-year freeze on these programs which expired at the end of 2016, and instituted the burdensome wind siting restriction that same year. Participants agreed that while they didn’t have an exact figure, Ohio’s jobs number would be far greater than the 105,000 advanced energy jobs today – an industry that is growing six times faster than any other in Ohio.